You’d need a thesaurus to come up with enough ways to describe just how bad the Buffalo Sabres were on Saturday afternoon. The words terrible, awful, disgusting and dreadful probably would have come up had you asked the fans about the team’s 7-1 loss to the Dallas Stars. On the other hand, you might have had trouble finding many people to ask to stretch their vocabulary in such a way – because most of them had departed well before the final buzzer. “It’s very disappointing and embarrassing,” coach Phil Housley said, and those words worked well too. And the fans who did hang around until triple zeroes were left gave the Sabres a less-than-literate but appropriate chorus of boos at game’s end. For the record, it was the Sabres’ worst loss in terms of goals in this dreary season. It was the team’s worst loss statistically since Feb. 1, 2014 – another 7-1 loss to Colorado. But that was on the road. This one was at home, and it was played before a sellout crowd. Yet this might have been a little worse than the score indicated. It was 6-1 after two periods, and the Stars might have been able to get close to double digits if they had the least bit of interest in padding their offensive statistics in the third period. It was a low point in an era of Sabre hockey that has had more than its share of them. 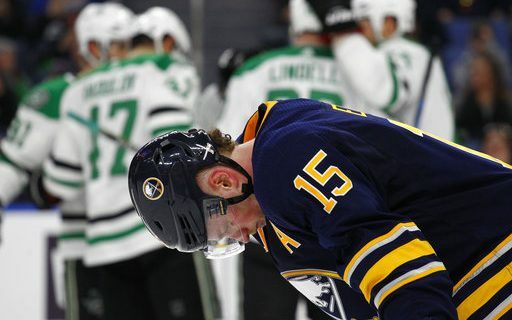 The Stars got off to a good start, as they stopped the Sabres from building on a close loss to the Rangers in New York on Thursday night. Dallas turned a three-on-two break into a goalmouth scramble. Remi Elie scored on the Stars’ third shot of the flurry. A few minutes later, Mattias Janmark made a textbook deflection of a shot from the point to make it 2-0. Janmark picked up his second goal of the day in the second period with a shot from the left side that Robin Lehner should have stopped but didn’t. Then came Buffalo’s one chance to make a game out of it. Sam Reinhart scored on the power play to narrow the lead to 3-1, and a small feeling of hope could be detected throughout the building. But these Sabres have acquired the unfortunate knack of giving up goals as soon as they get them. In this case, Jamie Benn needed only 36 seconds to restore the Stars’ three-goal lead. “There’s got to be something wrong, but I’m not sure there’s an easy answer,” Reinhart said. Esa Lindell and Radek Faksa made it 6-1 before the second period was over. Maybe it was appropriate that this was “Buffalo Sabres Library Day,” because a good book was needed to bring any entertainment value to the lifeless third period. To be fair, the Stars deserve some of the credit for the way this game went. Dallas improved to 27-17-4, displaying their speed and skill along the way. The Sabres are 1-5-1 in their last seven games, and they are facing a three-game trip to Western Canada this week. They are leaving in a dark state of mind as they continue to be reminded that they aren’t good enough to compete with good teams on too many nights. “We can say it in the room along the guys,” Gorges said. “But at the end of the day it’s up to yourself. I have to do it myself. We have to look in the mirror. The onus is on ourselves.